This is a small octagonal bowl composed of a stonepaste body which has been glazed and painted in blue and brown. 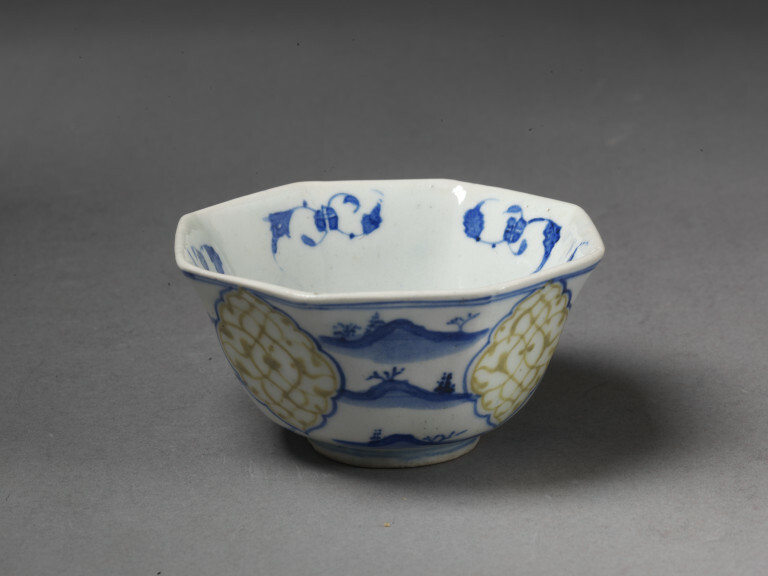 Small bowls along with coffee cups became popular in the last quarter of the 17th century, decorated by Persian potters in the same imitation-Chinese style as larger dishes and bowls. 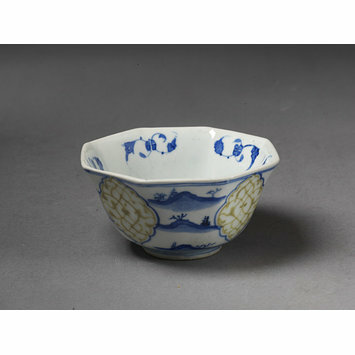 Glazed stonepaste octagonal bowl with imitation Chinese landscapes in blue and arabesques in brown. Possibly following special orders from Europe, fashionable smaller bowls were painted in much the same manner as larger dishes and plates with lake scenes, scrolling leaves and birds in flight. Yet it is only by the last quarter of the 17th century that small bowls and coffee cups come into their own. Bowl, fritware, of octagonal section, underglaze painted in blue with a misfired red slip, covered in a clear glaze; Iran, 1650-1700.